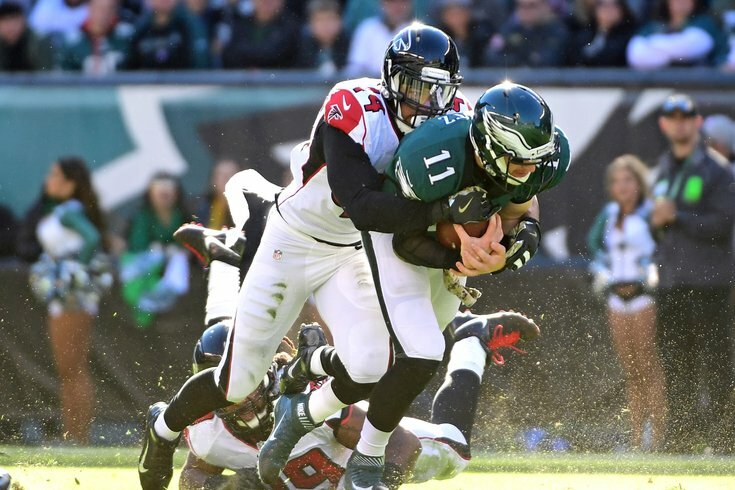 Falcons edge rusher Vic Beasley is a player some think could be released. On Wednesday, USA Today published a list of "25 NFL stars who could be cut during the 2019 offseason," that is, if you consider guys like Blake Bortles and Eli Manning "NFL stars." Still, they did the leg work of compiling 25 players they believe have unpalatable contracts who could be released by their teams. Released players should be of particular interest to the Eagles this offseason, since they don't count toward the compensatory pick formula. For those of you who are unfamiliar, the NFL awards free draft picks called compensatory picks for the losses vs. gains of players moving from one team to another in free agency. Signing players who were released by their previous teams would not offset the potential losses of Eagles players in free agency, like Nick Foles, Brandon Graham, Ronald Darby, etc. • Vic Beasley, DE, Falcons (27 in July): Beasley will count for $12,810,000 on a fifth-year option in Atlanta in 2019. The Falcons can rescind that fifth year option without penalty before it becomes fully guaranteed on the first day of the new league year. Beasley had one outstanding season in 2016 (15.5 sacks, 6 FF, 11 TFL), and the rest have been... meh. I find it unlikely that the Falcons would just let a player with Beasley's upside just walk in free agency when they have a reasonable amount of space under the cap, However, in the event he were to shake free, the Eagles love them some athletic linemen who can get to the passer. • DeSean Jackson, WR, Buccaneers (turned 32 in Dec): Jackson is scheduled to count for $10,000,000 on the cap in 2019, with no penalty if the Bucs release him. DeSean wants out, but his cost isn't that high for a player who can still take the top off a defense. Add in that he is a great fit for incoming head coach Bruce Arians' downfield-attacking scheme, and it's certainly far from a sure thing that the Bucs will cut him. The Eagles' offense badly needs speed, and Jackson is one of the most -- if not the most -- prolific deep threats in the history of the league. • Malik Jackson, DT, Jaguars (turned 29 in Jan): Jackson is set to count for $15,000,000 on the cap in 2019, $11 million of which the Jags would save if they released him. He is set to count for $15,750,000 in 2020, and $13,750,000 in 2021. Jackson admitted in December that he expects the Jaguars to cut him this offseason, seeing as he began losing snaps to younger players as the season wore on. Jackson was a great player on the Super Bowl-winning Broncos' defensive line in 2015, which caused the Jags to break the bank for him on a 6-year $85 million deal. Since then, he has had 18 sacks over three seasons in Jacksonville. He can still be a disruptive interior rusher in the NFL, would should appeal to the Eagles. • Gerald McCoy, DT Buccaneers (31 in Feb): McCoy will count for $13 million against the cap in 2019, with no penalty if the Bucs release him. McCoy would make for an outstanding partner next to Fletcher Cox on the interior of the Eagles defensive line, and he would likely not be asked to play as many snaps in the Eagles' DL rotation, which would keep him fresher than he's likely used to playing. He had 6 sacks each of the last two seasons, with 13 TFL and 24 QB hits in 2017; and 6 TFL and 21 QB hits in 2018. • LeSean McCoy, RB, Bills (31 in July): McCoy is scheduled to count for $9,050,000 on the cap in 2019, $6,425,000 of which the Bills would save if they cut him. Playing behind a crappy OL in 2018, McCoy ran for a paltry 3.2 yards per carry on 161 rushing attempts. The Bills have said they plan on retaining McCoy, which makes no sense, frankly, for a team not ready to compete for anything close to a Super Bowl run anytime soon. They'd be better served using that $6.4 million on younger players who can help them in the long run. Should he be released, the Eagles would have to feel comfortable that (a) McCoy still has something left in the tank, and (b) they would have thoroughly investigate his off-field issues. • DeVante Parker, WR, Dolphins (turned 26 in Jan): will count for $9,387,000 on a fifth-year option in Miami in 2019. The Dolphins can rescind that fifth year option without penalty before it becomes fully guaranteed on the first day of the new league year. Parker is a 6'3 receiver with 4.45 speed who was a first-round pick (14th overall) of the Dolphins in the 2015 NFL Draft. Parker fell out of favor with the Dolphins last year, appearing in 11 games, and catching just 20 passes for 309 and 1 TD. The Eagles reportedly kicked the tires on Parker at the 2018 trade deadline. • Robert Quinn, DE, Dolphins (29 in May): Quinn will count for $12,932,332 against the cap in 2019, with no penalty if the Dolphins release him. He was a beast early in his career, but his production has fallen off. On a cheap deal, he might make sense as a rotational guy if Chris Long decides to retire. Quinn had 6.5 sacks, 2 FF, 9 TFL, and 15 QB hits in 2018 in Miami.